1954 Lincoln Capri Convertible - Click for more photos! 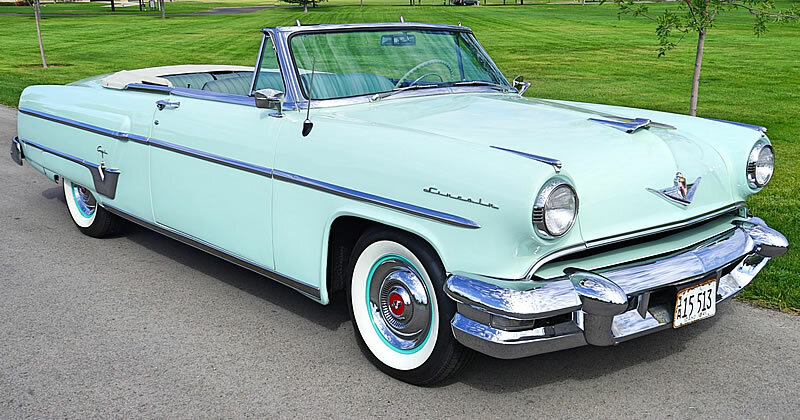 This 1954 Lincoln Capri Convertible is presented here in its original color of Cantebury Green (code 13). The brochure told as how the Capri was, "Newly designed and powered for a modern living". However externally the Capri had changed little from the previous year except some trim placement and a revised bumper/grille combination. The front edge of the hood no longer had LINCOLN spelled out across it and new crest emblem with a large V emblem. The stainless steel side trim now ran the full length of the car and sat higher than the previous year. Mechanically things were pretty much the same as last year. The interior colors blend well with the exterior paint. The seats are a contrasting black leather and green cloth combination (full leather was available as an option). 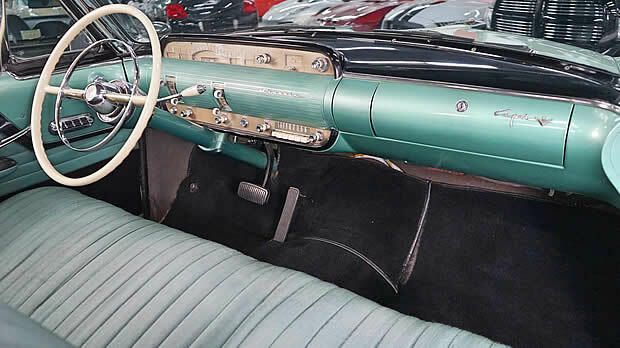 The dash / instrument cluster is uniquely Lincoln and has a look reminiscent of the Art Deco period. A four-way power seat was also fairly new and introduced 1953. A 317.5 cubic inch V8 engine produces 205 horsepower and Hydra-Matic automatic transmission (made by GM) - both were standard on all Lincolns in 1954. Lincoln made 1,951 Capri Convertibles for the 1954 model year at a base price of $4,031. It was the top seller for Lincoln that year.